I won't be talking about the film or the script or the actor, Eddie Cantor. It's one of those odd stories which start in the present (1930s) and because of some kooky plot point (a reverie of sorts) it ends up in Roman times. This kind of storyline is very popular with the PEPLUM genre (don't ask me why). 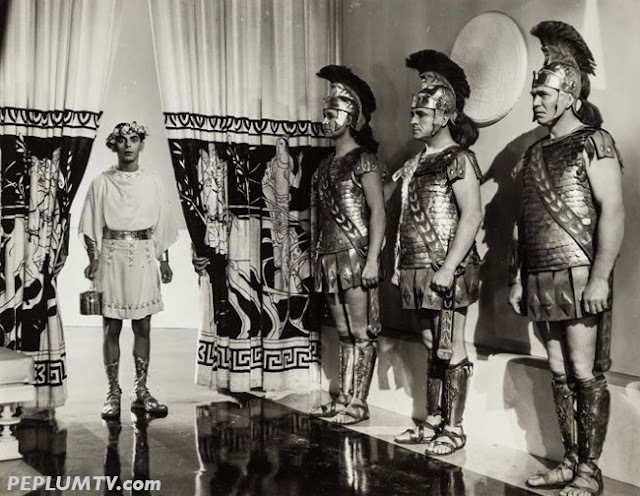 I'll just mention the production: it's one of the best looking films set in Antiquity. A lot of money was spent on it (or it was made to look like a million bucks). Personally, I think the film is totally outdated. A real curio from the past. It's a shame such a good looking PEP is so difficult to watch or to enjoy. I think ROMAN SCANDALS is one of he very few Peplums that actually works well as a comedy. In 1933 it was well received and was one of the most successful films by United Artists that year. Some of the jokes are quite funny, and the slave market dance sequence by Busby Berkeley is well done.